Heat your oven to 425F. In a small food processor, pulse together the herbs and the pistachios with a pinch of salt. Drizzle in the quarter cup of olive oil with the processor running. Continue to add olive oil until the pesto has a consistency somewhere between a paste and a sauce. You can also finely chop the herbs and pistachios by hand, then stir them together with olive oil and salt in a bowl. Once everything is well mixed together, taste and add more salt if necessary. Set aside. In a heavy baking dish, toss the carrot pieces and lemon halves with a good splash of olive oil and a sprinkling of salt and pepper. Stick them into the oven and roast, stirring once or twice, until the carrots are tender, about 20 minutes. Put your fish in a separate, lightly oiled, baking dish and sprinkle it with salt and pepper. About 5 minutes before the carrots are going to be done, put the fish in the oven. Roast the fish until it flakes easily. How long this takes will depend on how thick your fish is. Ours took 10 minutes. As the fish finishes, take the carrots out of the oven. Add the arugula to the baking dish with another big pinch of salt, and toss everything together using tongs, squeezing the lemon as you toss so its juices are mixed in. The arugula will only take a few moments to wilt. Divide the carrot and arugula mixture between 4 plates. Divide the fish into 4 pieces and put a piece on each plate, then drizzle with the pesto, and serve. Wow. This looks like something I am going to have to make soon. Cilantro and parsley are not so expensive, which adds another impetus to try this! This looks insanely good! I’m not a huge fan of cod but I can imagine it goes great with the pistachio pesto, thanks for the recipe! This is incredibly delicious, I am not a fan of cooked carrots but I think I could eat them the way you prepared them and anything with arugula added is tops on my list. I love that you added lemon. What a perfectly gorgeous meal. This is so similar to what I had for dinner tonight! So colorful. Beautiful! Beautiful! I love your combination of warm arugola (I prepare many pasta dishes the same way) and pistachio! Excellent, you’re posting more of your everyday, busy week-night dinners! This looks impossibly beautiful but I can see that it is actually quite simple to execute 🙂 Perfect! 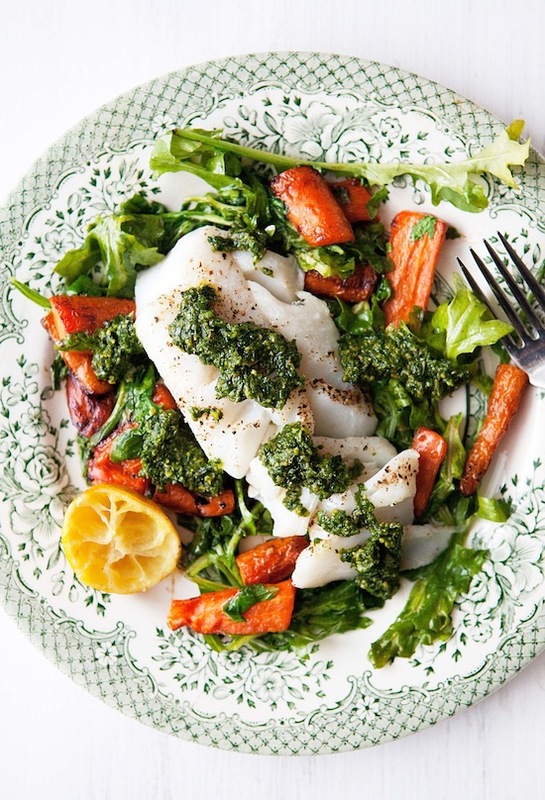 Love the pesto spread on the cod… such an invigorating way to bring so much flavor! I love your blog. I have some white fish in the freezer… hmmm! You are currently reading Roasted cod with pistachio pesto, carrots, and arugula at Five And Spice.